Happy 5th Birthday to this website! Five years ago this website went live and this was the result of several months of hard work and planning. 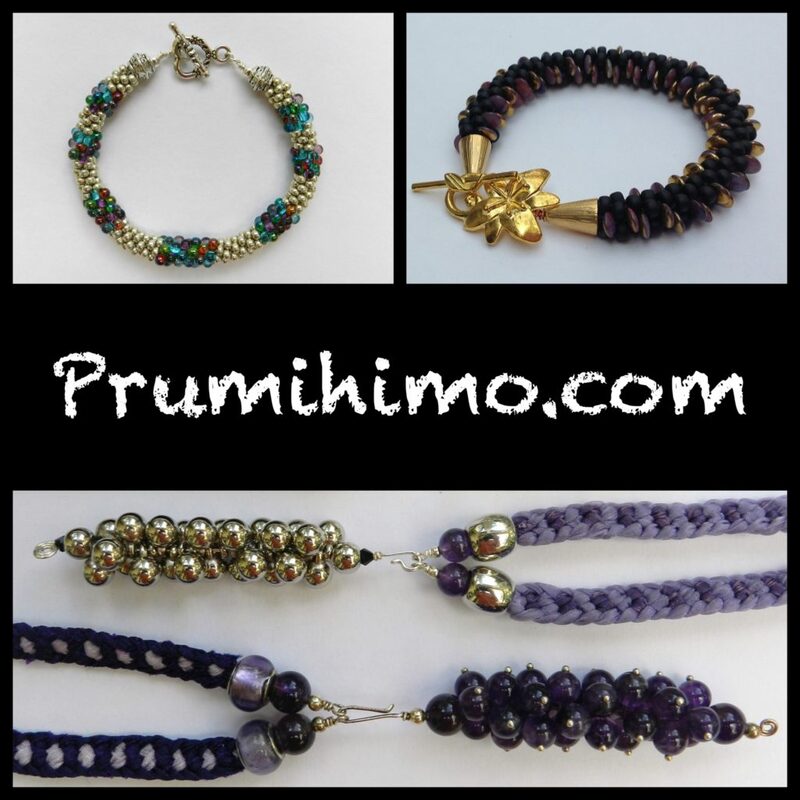 I had already been enjoying kumihimo braiding for 3-4 years and my work had been published in 3 different jewellery magazines, so I was already reasonably experienced as a tutorial writer. It seemed a logical next step to start to write tutorials to sell myself. Etsy would have been a possiblilty, but I wanted to have the opportunity to offer more than just a sales platform. Kumihimo has given me a great amount of pleasure over the years and I have been lucky enough to be able to devote a lot of time to it, enabling me to develop new ideas and techniques. I wanted to be able to share my way of doing things and pass on the little tricks and tips which can make such a difference. In the months prior to the launch I worked on instructions for all the most popular kumihimo braids on the round disk and produced easy to follow instructions with photos. I also wrote up instructions for basic jewellery making techniques and knots. I wrote 3 tutorials specially for the launch. My tutorials are always completely original designs with a level of complexity which requires either very detailed instructions or a specific threading chart. A tutorial takes a great deal of hard work, experimentation, photography and materials to bring to fruition, so I feel it is fair to charge for them. However, there are other designs or techniques which can be explained in a few sentences, so these are what I offer as free mini tutorials and it has always been important to me that people can visit this site and enjoy its content without feeling that they have to spend money. To round off the launch information I wrote a short history of kumihimo and provided a biography of myself, my published work and a gallery of my designs. Over the last 5 years the website has evolved as I regularly add content. I write a blog every couple of weeks and although I haven’t tried to count them, I would guess that there are in excess of 150 blogs covering a multitude of kumihimo related subjects and announcements. The Pru in Print section has swelled as I found myself being asked to write for more and more magazines. I have now written tutorials for 6 different publications in the UK, Australia and the US. That section needs an update because quite a few are missing! The Resources section has grown considerably with the addition of further braid structure instructions, a large resource for braiding on the square plate, some new ending methods and further free mini tutorials. A whole new tab had to be set up when I started working for Jewellery Maker because I wanted to share the designs I made for the show more widely. Two and a half years of appearances on television generated a wealth of unique designs. The company at that time was a gemstone supplier, so I was given the opportunity to work with some stunning stones and had to work out some innovative ways of using them. In this section I provide links to the recordings of the shows, so the demonstrations can be viewed for some of the designs, to support the written instructions and photos. When I set up the website I had no idea of what the future might hold and the Prumihimo disk was just an ambitious dream at that stage. When my dream came true a new tab had to be raised! Under the Prumihimo disk tab I provide general information about the disk, including instructions for two designs and a popular FAQ page. Here you can also find links to the pages of other designers who have worked with me to produce kits. I have a tab for workshops, but I have to admit that I am a bit slow to keep it updated. Note to self – must do better! I teach in workshops in some lovely shops, Stitchncraft, Spoilt Rotten Beads and Riverside Beads and I also teach at the Big Bead Show twice a year. My catalogue of tutorials has grown from the original 3 to a current total of 35. This continues to grow because my great passion is designing and I have always enjoyed writing tutorials. Sometimes an idea comes to me and works out straight away. One design took just a single week from conception to publication and was an instant best seller. Others take much, much longer because the original idea does not quite work out as I want it to, so I need to keep working on it to refine it until I am satisfied. YouTube has been an exciting new project for me. In January 2017 I started uploading regular videos to my YouTube channel and I wanted tobe able to provide additional information about these videos on my website. Under the YouTube tab you will find a page for every video containing information, such as the details of the quantities required, or the disk set up, as well as photos. If I receive messages requesting something I post it on the relevant page because it is not practical to make changes to a video once it has been published. So what is next? I will need to set up a new tab in the next month or so because of an exciting new development, but I am afraid that I am not going to say any more at this stage! In the meantime, please enjoy the content of this website. If you browse the different tabs you are sure to come across something unexpected and informative!